Your skin deserves the very best. And you deserve to be pampered in the highest of luxury. This means, of course, that a trip to Guerlain Spa is of the utmost importance. I had been curious about the services at Guerlain Spa for quite some time. I've long been a fan of every product Guerlain creates, so it's no small wonder that a trip to the spa was in the cards for me. Nestled inside The Waldorf Astoria Hotel, this spa delivers everything one might expect from a five-star experience and more. The moment you step off the elevators into the sleek white and silver space, you're instantly transported from the hustle and bustle of the city below into a calm, quiet oasis. On my visit, I experienced the Radiance Facial, one of the cornerstone treatments of the spa. This treatment really was like no other. To begin with, I was ushered to the beautiful salon area and presented with a glass of champagne and some little treats while I waited for my therapist to collect me. 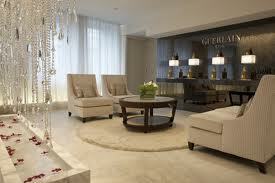 The salon is filled with comfortable couches and armchairs that it's impossible not to sink into immediately. I would have taken a nap if I weren't so excited about the treatment I knew was coming! And that's when the real fun began. I was blown away upon entering my treatment room ... for this was no ordinary spa room. No, at Guerlain Spa, you're given a room complete with your very own bathroom and a host of Guerlain products to enjoy after your treatment has finished. The bed in the treatment room. And yes, it was heated! The Radiance Facial is definitely one of the better facials I've experienced in the city. It's customized to your skin based on a consultation with your therapist. My frequent travel always leaves my skin on the dry side, so we focused on hydration for my treatment -- but this facial can be changed based on your skin type and concerns. From the expert cleansing and painless extractions to the calming face mask and upper body massage, this facial was head and shoulders above the rest. And my skin? Talk about GLOWING. This facial isn't called the Radiance Facial for nothing -- my skin was a thing of gleaming beauty afterward, with nary a dry spot in sight! In short? A visit to Guerlain Spa is most definitely a must when you're looking for a little luxury in your life. The Radiance Facial is $195 for 50 minutes. For more information and to book an appointment, visit waldorfnewyork.com. AHHHH looks amazing.. might have to save up & splurge next time I'm in NYC!